– a picture a day (yeah, right), this blogger's okay. I was trudging to the shop a couple of days ago when I espied this street sign – which was odd, as I’ve walked the same way to the shop many times and the sign isn’t new. 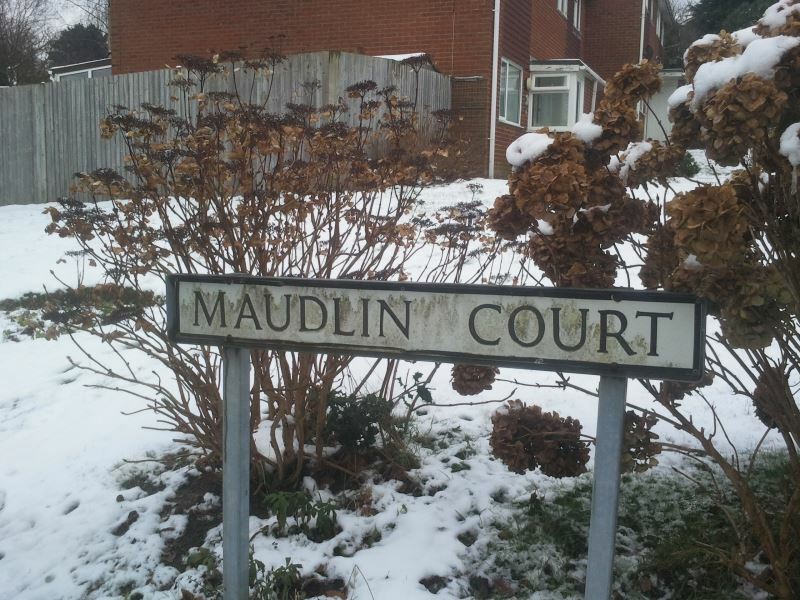 Now, I don’t know about you, but I wouldn’t want to live in Maudlin Court. A small pied-à-terre in Goldmine Alley would be super, but a gaff in Maudlin Court, no. Then I thought about other places I wouldn’t desperately like to live. Depression Way in Grayling, Michigan, didn’t sound like a barrel of laughs – even though it’s just down the road from Gaylord. Depression Hollow in Smethport, Pasadena, didn’t float my boat, either…. It was lucky I had other things to do at this point in the inquiry, otherwise I’d need a good few hours with the rather apt blue light. Most humans are diurnal (active during the day), except for me. During the winter months I could happily hibernate and sleep for England. I also (woe, woe, and thrice woe is me) suffer from SAD (seasonal affective disorder). Otherwise known as winter blues, it’s rotten, and proof that no matter what we think we are, we are animals like every other creature on the planet. Animals with a body clock – a circadian rhythm – that gets upset during the winter months because of the limited daylight. It’s our body clock that governs whether or not we’re ‘larks’ (those who get up and go to sleep two hours earlier than average), or ‘owls’ (those who get up and go to bed two hours later than average) and our body clocks (chronotype) are as much outside our control as the colour of our eyes, the colour of our hair, and how tall we are. Bloody body clock! I can re-set my watch, why not my body clock, too?